Plants thrive in a spot with full sun and sandy soil. A little compost added at planting will encourage good flower growth. Crown rot is a common problem with gerbera daisies, which is caused by planting the crowns too deeply. The crown should be visible above the soil and allowed to dry out between each watering. Plants can be mulched, but care must be taken that mulch does not cover the crown. If you live in a wet or humid climate or have heavy soil, try planting in well-draining pots instead. 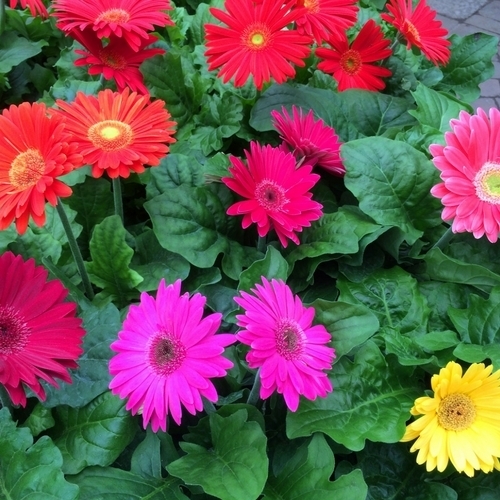 Make sure you plant gerbera daisies with adequate spacing and lots of sun. A little bit of light shade in the height of summer will work, but without full, direct light the plants will get leggy and pale and not produce nearly as many blooms. Water in the morning so leaves can dry out during the day to lessen the risk of rot and fungal diseases.